Last year I posted a Winter Creative Writing packet for younger students. It was well-received, so my intent was to create full-size bundles of creative writing exercises for all four seasons. 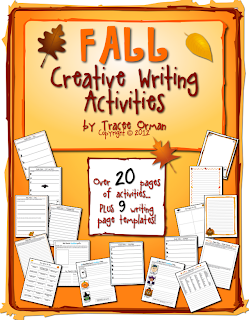 Well, here we are in September and I am just now posting my Fall Creative Writing Activities packet. :) Even though these are designed for students aged 10 and up, many of the activities can work for older students, as well. 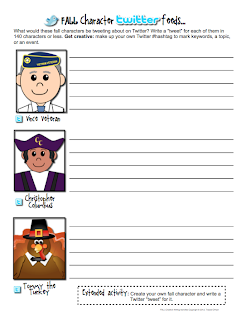 Students will practice writing acrostic, haiku, and chance poetry, short stories, and short narrative "tweets" based on fall characters. This bundle has double the activities that my winter packet contained, hence the price. Download the preview for a sample activity and thumbnails of all the pages. 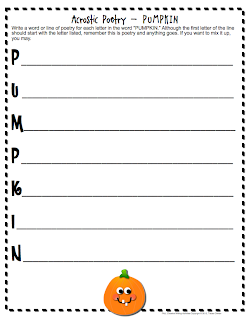 As a bonus, it also includes 12 pages of writing pages in fall themes. Use these for various writing assignments, stationery, or anything!